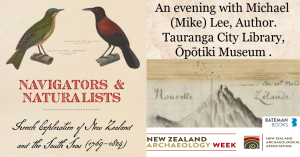 « Pecha Kucha – Hidden Stories – an evening of quick fire talks on archaeology. Michael (Mike) Lee first came across the journals of Dumont d’Urville’s 1827 Astrolabe voyage in 1996 when writing his thesis for a University of Auckland Master of Science degree in Biological Sciences. This sparked his interest in the largely unappreciated role of French navigators and naturalists in the scientific discovery of New Zealand, the Pacific and Southern Ocean, and he has been researching and writing about this aspect of New Zealand’s history ever since.